YITH PayPal Payouts for WooCommerce allows you to pay all the commissions that are generated by your affiliates. In order to enable the two plugins to work together, make sure both of them are installed and activated. Configure YITH PayPal Payouts on your shop as explained on this page. Whenever an affiliate drives a sale to your shop, you will see the list of commissions under YITH Affiliates > Commissions. Based on the settings of your affiliate payments, the plugin allows manual and automatic payment of affiliate commissions. If you have selected the manual payment of affiliate commissions, every sale driven by an affiliate to your store will appear as in the following screenshot. Next to each commission you will find some buttons that perform different actions. Among them you find the option to pay the commission via PayPal Payouts. Just click on it to pay one specific commission. As an alternative, you can bulk select more than one commission and process the same action for all of them. Make sure you select PayPal Payouts and all payments will automatically go through it. 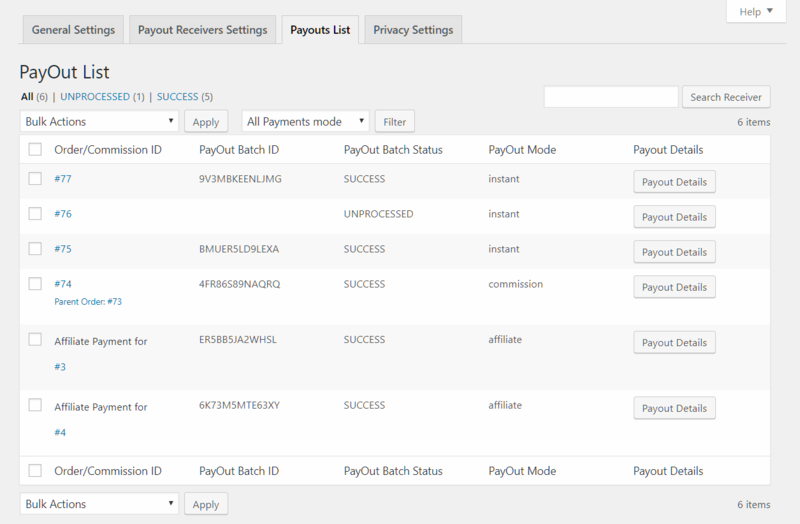 Once the payment is done, you will also be able to see this payment in your Payouts List. It will be easy to spot the payment of affiliate commission, as they are listed as Affiliate Payment for (followed by the affiliate payment ID) and will take on the affiliate status in the PayOut Mode column.